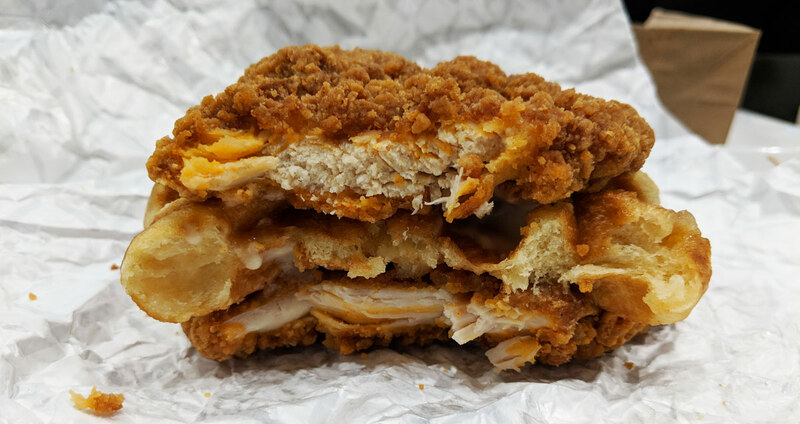 As ridiculous as the Waffle Double Down looks (and yeah, it is ridiculous), it’s basically just an oddball presentation of chicken and waffles. And everybody loves chicken and waffles. So it follows that this thing must be pretty good too, right? Well… it’s not awful, I’ll give it that. 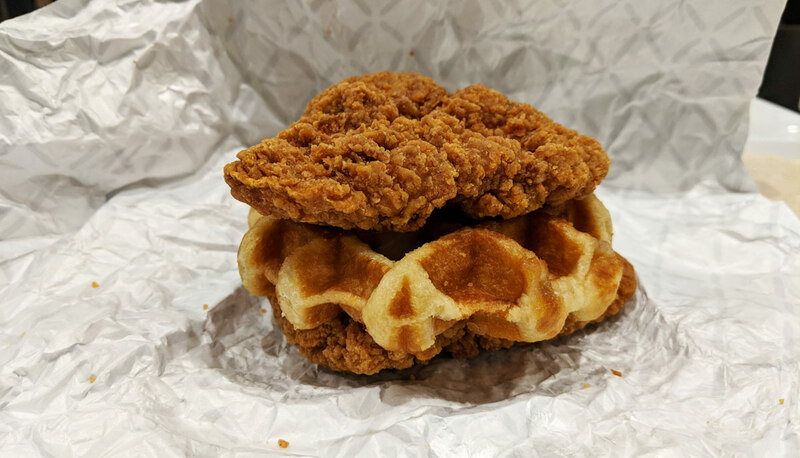 The Waffle Double Down is actually pretty simple: it’s two fried chicken patties encasing a Belgian waffle with maple aioli. I sort of figured that the aioli would be subtly sweet, but I think it might actually be sweeter than just plain maple syrup. As soon as I unwrapped the sandwich (assuming that this thing even qualifies as a sandwich, which is questionable), the maple aroma hit me in the face like a ton of bricks. And that was one of the main issues: the sandwich is way, way too sweet. 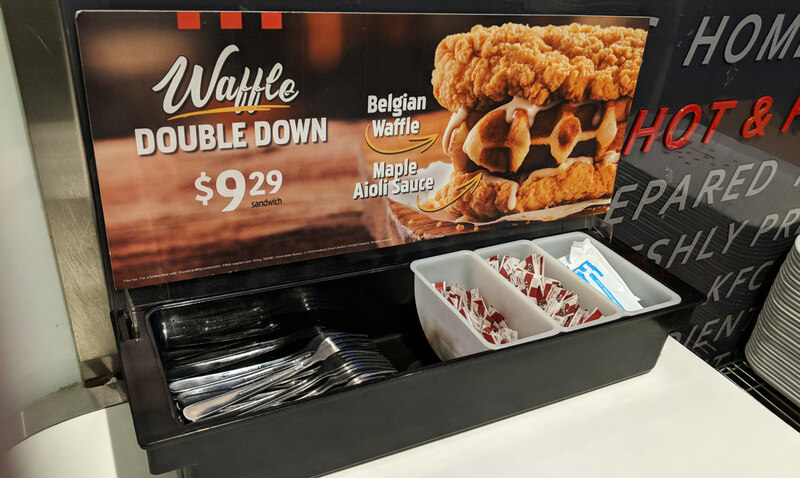 I like the combo of sweet and salty, and I quite like chicken and waffles, but this is leaning way too hard in the direction of in-your-face sweetness. It’s almost dessert. The other issue is the chicken itself. You can get it regular or spicy; I went with spicy, because if someone asks you if you want something spicy, the correct answer is always yes. And it’s not bad — the exterior was crispy and tasty, with a decent kick. But the chicken was overcooked and dry, and since there’s so much of it, that’s an issue. I had to constantly chug water between bites just to keep my mouth from completely drying out. The waffle was exactly what you’d think it would be. If you’ve ever had prepackaged Belgian waffles, then you know what you’re getting. It’s fine. I actually wish that they’d drop the gimmick and just make this a regular waffle sandwich. Because as it is, there’s an absurd amount dry chicken and not enough waffle. The proportion is off. It doesn’t taste right. Oh, and this thing cost about $10.50 with tax, which is crazypants. It is absolutely not worth that much money.